The story doesn't get much more elaborate than the premise. Basically, a boy who's been fighting with his younger brother receives a dinosaur egg in the mail. He opens it before Christmas, and it hatches into a pterosaur, which the kids hide from their parents. Working together, they raise the animal, which grows up in a week or so. There are a bunch of side plots that go nowhere involving the kids' parents almost finding out about the dinosaur, the kids acquiring fish to feed it, and a nosy neighbor who sees the dinosaur but can't get anyone to believe her. Realizing the pterosaur wants to be united with its actual family, on Christmas Eve the older boy throws together a harness and takes the dinosaur to where it's supposedly from, a hidden land in the Rocky Mountains. They find the place but don't see any other dinosaurs. However, something that looks like a raptor spots them while they're flying away. 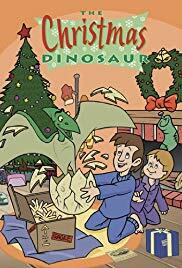 The next day is Christmas, and the kids finally decide to show their parents the prehistoric monster they've been hanging out with. The parents freak out, of course, but by then it hardly matters. A parade of dinosaurs show up in town looking for the lost pterosaur, who returns with its family. There's a bizarre sequence at the end that's worth mentioning. The raptor from earlier watches the kids say goodbye to their pet, and it sheds a tear. Just then, a brontosaurus inadvertently steps on it. At the end, the creature emerges alive from the snow. It's Christmas night by then, and everyone's inside. It quickly makes its way inside while holiday music plays and the camera zooms out. And... I almost think it's going to eat everyone. It's a raptor, right? Is that the joke they were going for? Maybe it was just trying to imply "the kids get a new dinosaur pet after all," but I'm not convinced. The special, unsurprisingly, was pretty bad. Even setting aside the paper-thin story, the production values were pitiful. The animation had the hallmarks of early computer-assisted drawings, from before most production companies figured out how to make that look good. And most of the voice acting is awful. I wasn't surprised to see the director had literally nothing else credited on IMDB. The identity of the writer, on the other hand, shocked me. This is credited to Michael Ryan, who's worked on some of the best animated episodes and series I've ever seen, including Powerpuff Girls and Scooby Doo: Mystery, Inc. I can't imagine why anyone would want to track this down, but if you're curious it seems to be up on Youtube for the time being. It's certainly not the worst thing I've ever sat through, but there's really nothing special about it. That said, I still want to know whether the raptor ate those kids.